The fact that at one time Norwich boasted a pub for every day of the year and a church for every week, gives you some idea of the city’s character. They may not number as many these days, but it still does both rather well, from its two cathedrals to its many thriving yet ancient pubs. Norwich has a fascinating and sometimes tumultuous history and this is evident everywhere from the fascinating Norman Castle, standing proud over the city, to the perfectly- preserved medieval cobbled street of Elm Hill. The city grew out of various Saxon settlements along the Wensum river and in the Middle Ages was second only to London in its importance as a trading post. History is richly textured from the city’s great weaving supremacy and church-building resulting from its prosperity, through the great rebellion led by Wymondham farmer Robert Kett, and into the 16th century when ‘strangers’, weavers from the Netherlands, came to Norwich. They also introduced canary-breeding and the emblem is synonymous with Norwich City Football Club. Today Norwich remains one of the best-preserved medieval cities in Europe but it is also a top-ten shopping destination with plenty to see and do. Tour the castle’s museum for a ride in a chariot similar to one used by East Anglia’s own Queen Boadicea and be spooked by the dungeons and centuries-old death-masks from public executions. Relax with a boat ride on the Wensum (around the city or head out to the Broads), or visit one of the 32 medieval churches, some of which have been put to new uses as art galleries and exciting new venues, hosting exhibitions, vintage fairs and even fashion shows. Other attractions include Strangers’ Hall, a magnificent Tudor House; Dragon Hall, a medieval trading complex and the Plantation Garden, a secret late Victorian town garden. "As the sign says, Norwich is truly a fine city and to me one of the best in the world from its rich history, its beauty and the wealth of independent entrepreneurs that make it a fantastic and unique place to explore on days out or to stay for a city break." The words that greet the visitor to ‘Norwich: A Fine City’, are the perfect embodiment of what the city has to offer, stating the case exactly as it is: a fine history, a fine culture, a fine future and the city thrives today just as it has throughout the centuries. There are activities, shops, events and facilities for everyone of every age. Although there is no longer a pub for every day of the week, there are plenty of pubs remaining and the city celebrates them every year with a City of Ale festival in June. Visit Norwich’s oldest pub, the tiny Adam and Eve, or one of the newer additions, the real ale specialist and multi-award winner, the Fat Cat. The diversity within this fascinating city is astonishing, and past and present contrive to blend seamlessly in its many streets and lanes. Modern buildings such as the acclaimed Millennium Forum sit cheek by jowl with medieval church towers, while the regenerated market is as flourishing and bustling as ever. along the river or over the bridge into the centre. The Forum is a good place to lay plans for exploring the city, whether you choose a guided tour or to make your own discoveries just by wandering through its lanes and arcades. Although the scale of the place is friendly to the foot, it is worth remembering that, having experienced rapid expansion from the original Saxon settlement, Norwich was once the largest walled town in England, and fragments of the original city wall can still be seen. 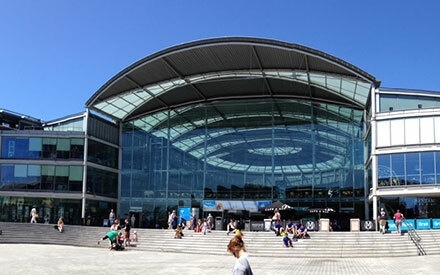 Shopping in Norwich is varied and excellent, constantly widening in its range, particularly since the Chapelfield development opened with many big-name shops and a good variety of new cafés and restaurants as well as an expansive underground car park. Great pleasure can be derived from walking around the shopping areas of Gentlemen’s Walk, Castle Meadow, Timber Hill, the sensational Art Nouveau Royal Arcade and the historic Norwich Lanes; a vibrant area of the city with a whole array of independent shops. The walk along London Street leads you from Norwich Lanes to Queen Street and on into Tombland in Norwich’s Cathedral Quarter where there are a number of great cafés and restaurants. This beautiful part of the city is full of historic buildings, diverse cultural activity and a continental atmosphere and has been widely used as a film and TV location. 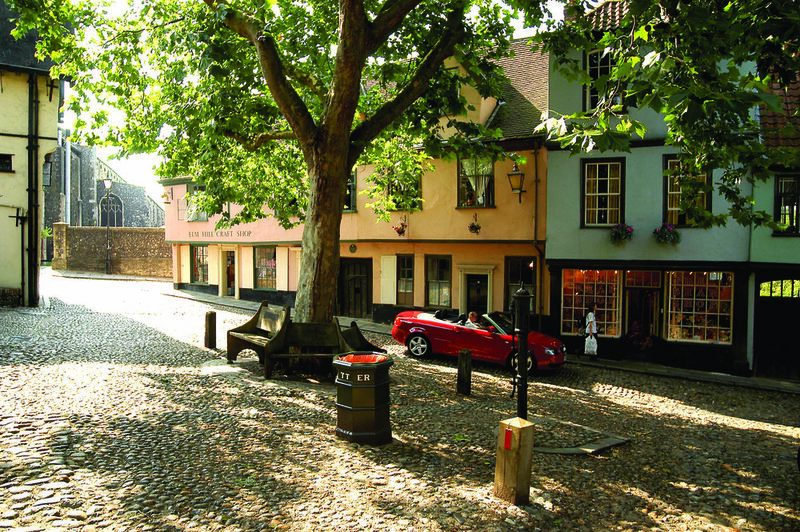 Make sure you make time to visit cobbled Elm Hill, one of the prettiest streets in the city, its steep road leading the eye from one enticing shop to the next. Then head back into Tombland and across to the tranquility and beauty of Cathedral Close where many of its buildings are part of King Edward V1 School, whose choristers sing in the cathedral. As you explore you will stumble upon one historic structure after another: the famously beautiful Pulls Ferry on the riverside, Cow Tower on another bend of the river, a defensive tower dating from the 13th century, or Bishops Bridge, the oldest in Norwich. The river informs the whole history of the city and there are some beautiful new developments lining its banks today, while Riverside just across the road from the railway station, is a centre of cinema, bowling, clubs and restaurants. From here and various points along the river trips can be taken out to the Norfolk Broads or just around the city. You will also observe how many interesting museums and galleries there are in the city, and its cultural life is abundant all year round. There is a great diversity of theatres and cinemas, most celebrated of which is the Theatre Royal while the Norwich Playhouse and The Maddermarket are also thriving. In May, the Norfolk and Norwich Festival brings performers from all over the world and is not to be missed.